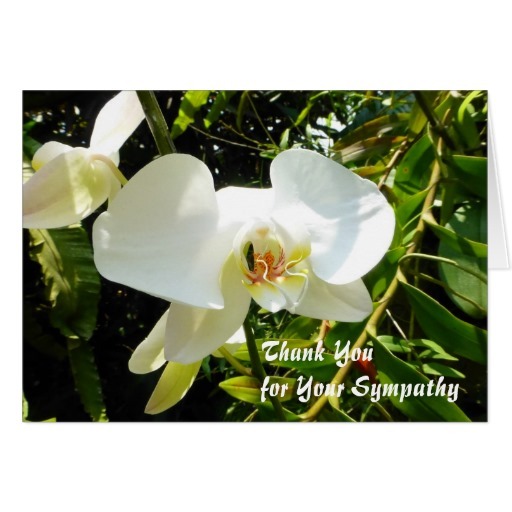 We have created a range of sympathy thank you cards with our own original photographs. We hope you will like them. 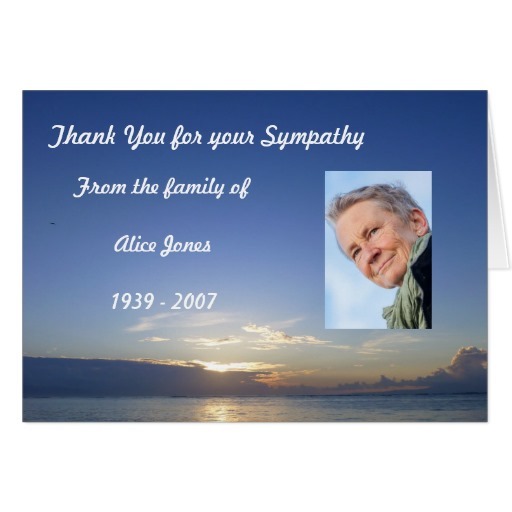 Proceeds from the sale of these cards go towards the upkeep of this website, which helps people who have suffered any kind of loss or bereavement. We hope you will also read some of those pages as a comfort to you in your loss. There are lots of designs to choose from, including beautiful flowers, sunrises and seascapes. Add a photo of your beloved to make them special to you. Below we have also provided a few sample messages for you to write. Scroll down to see the customisable designs, or click here to go straight to the store and see the whole range. Save by choosing the smaller note card size and buying in bulk. 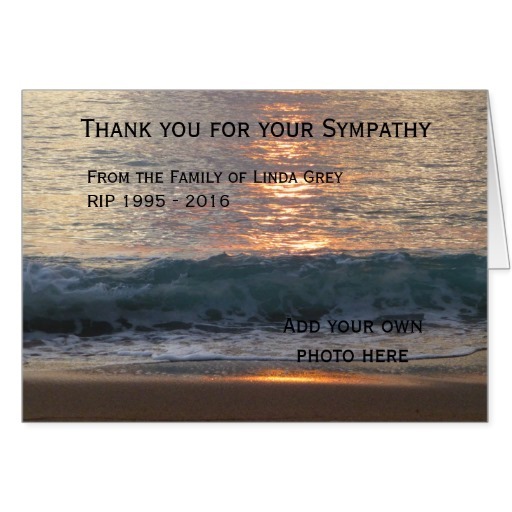 If you need to send a quantity of funeral thank you notes, or replies to sympathy cards, you get a discount the more cards you buy. 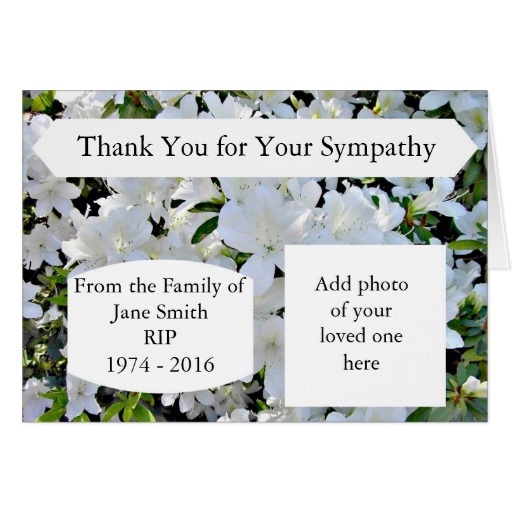 Our sympathy thank you notes are suitable for many other occasions too. Thank you notes for flowers, for a gift, for looking after a pet. 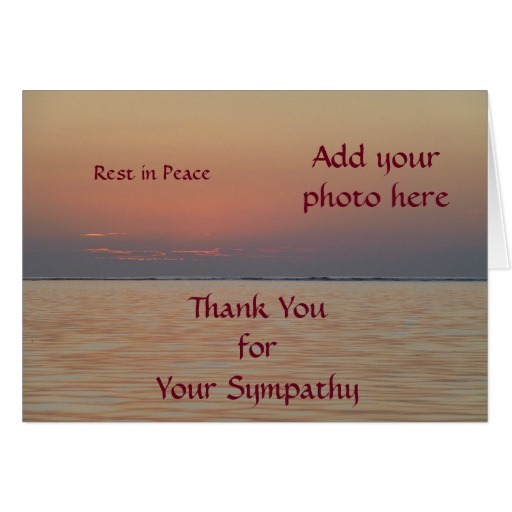 If you need help deciding what to put, we have a sample sympathy note or two below. The cards are customisable, which means you can add your own text to most of the cards on the outside or the inside. It's useful to be able to add text of your own on the inside if you want to send a card direct to someone, and you can enter their address instead of your own when you checkout. Thank you so much for sending me flowers when .......died. It has been a great comfort to me knowing that you were thinking of me, and there in spirit if not in person. It's hard, but I am trying to keep busy and get back into a routine. I will ring you in a few days when I'm feeling stronger. Thank you so much for your card and the beautiful words you sent me. My lovely ...... would have been so proud of all the cards and flowers and all the people who came to the funeral. We had a really good turn out. It is a comfort to me to know how much he/she was loved. I hope that we can keep in touch and that I will be able to make the journey to see you in the coming months. It was such a comfort for me to see you at John's funeral. He would have been amazed to see how many people came, and to hear all the lovely things that were said. The house is still so full of flowers, which are very special. I still can't believe it's happened. I suppose I'm still in shock, but I will take each day at a time, and gradually try and get back into some sort of routine. I have to be grateful for the happy years that we had, and take comfort from that. 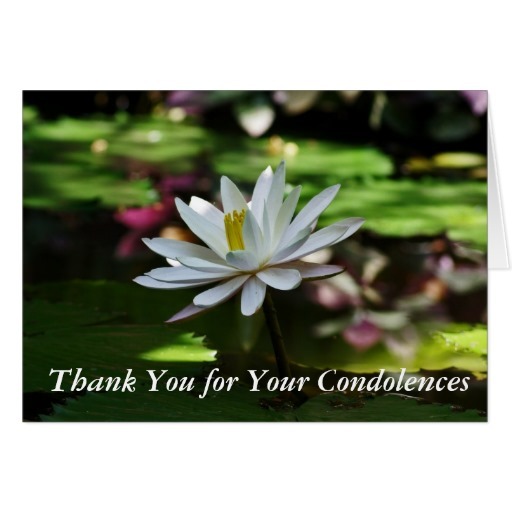 The following cards have been designed for you to add a photo of your beloved. It's easy to do and you can change the text and add a message inside. If you have suffered a bereavement, may we wish you our deepest condolences. We have many pages which may be of comfort to you in your grief. Check out the advice pages in the navigation bar.